KOKOMO, Ind. — Alivia Steward learns about leadership — by serving. 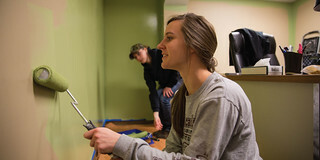 Freshman learning community volunteersAs part of her Indiana University Kokomo freshman learning community, Steward, from Delphi, spent an afternoon painting an office with her classmates at Bona Vista. The freshman learning community, taught by Kristen Snoddy and Joann Kaiser, focuses on leadership. It is paired with a literature course, focused on Suzanne Collins’ The Hunger Games trilogy. Students performed many needed projects at Bona Vista, a Kokomo not-for-profit. In addition to several painting jobs, the students cleaned out a greenhouse, moved and added on to office cubicles, and filled potholes. Jeff Mercer, Bona Vista’s director of maintenance, appreciates their help. He has a small staff maintaining 14 facilities; so the extra help means they can get more done. All IU Kokomo freshmen participate in a learning community, with several to choose from, based on their majors and interests. Amber Phillips, from Delphi, chose this one for the leadership content and because of the literature selection. “I’ve learned how to read and understand novels, which will help me in future classes,” she said, adding that she’s also learned leadership skills and made some friends. Michael Gammons, Kokomo, and Jordan Smith, Peru, worked with a Bona Vista crew to move a set of cubicles, and build new ones. Smith gained skills in being an effective part of a group project, and was glad to do something to assist a local agency. Gammons said the freshman learning community taught him communication skills, which will be important to him with his career in criminal justice. “I’ve learned how to take a leadership role, and how to be a follower, when it is constructive,” he said, adding that he enjoyed the volunteer service.